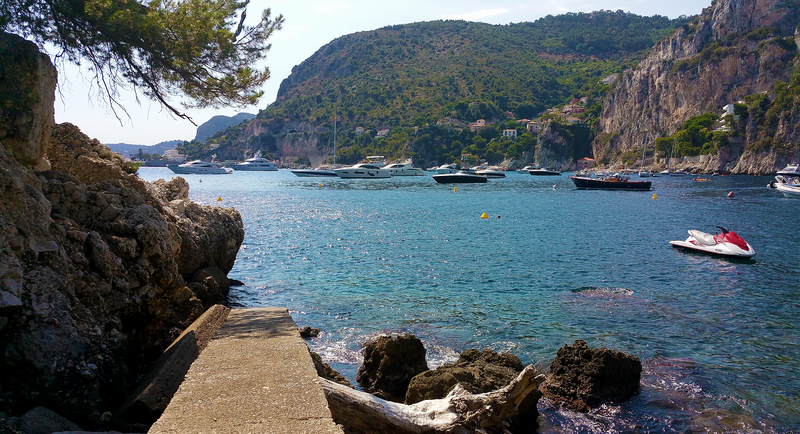 One way that I reconcile my hefty wanderlust with a demanding corporate job is to make the very most of work travel – whether in this case to the French Riviera, or more commonly, domestically. For instance, when my company was owned by 3M, my job occasionally took me to the massive headquarters in Minnesota. During these trips, I explored what I could of the neighboring states, checking off both Dakotas and Wisconsin in my quest to visit all 50 – to my great satisfaction, as those wouldn’t necessarily be easy to reach. I appreciated ‘the land of 10,000 lakes’ and especially sunsets over them, the incongruity of so many Somalis living in what to me is basically the arctic (while contributing great eateries), and the solid amount of music that comes through the Twin Cities. I even managed to catch a Chris Cornell concert, may he rest in peace. However, 3M then sold our business to a French company, and I now have a new boss in the south of France. Long travel from LA, some language challenges, but undeniably, infinitely plus chic than Minnesota. I couldn’t be more enthusiastic about this arrangement. 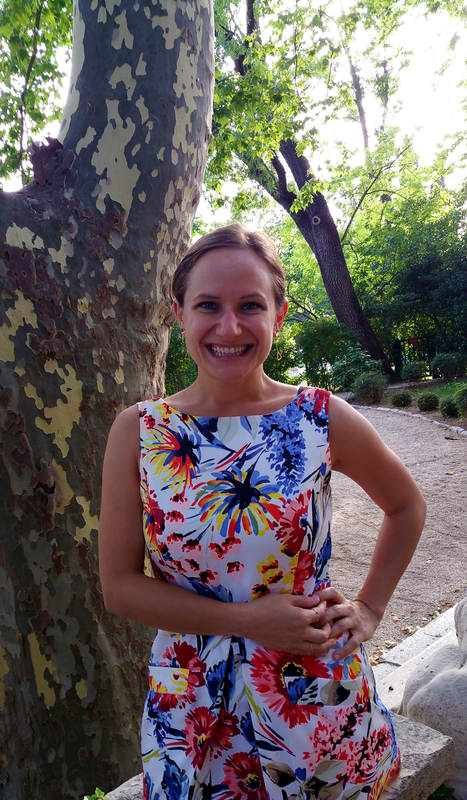 My first international business trip came in July – a desirable time to visit this part of the world, and when the lavender fields bloom in Provence! I’d previously visited Paris in the winter, which included the best oysters of my life fresh from the cold, cold ocean. But this time, I was thrilled to pack only sandals (dressy ones for work, flip flops otherwise) and no jacket. The downside was that the trip came on somewhat short notice, at a time when I didn’t feel I could properly extend it. 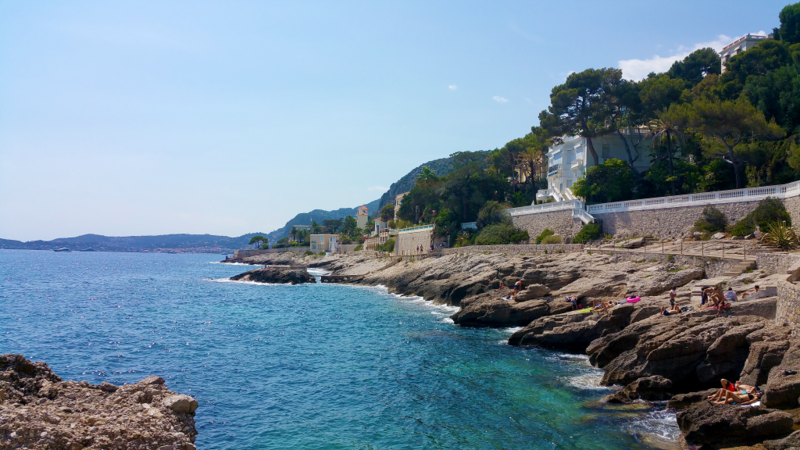 So, I had just two days to explore the French Riviera (known as Côte d’Azur in French) on my own. Researching places that looked interesting, I planned a rough itinerary down to 10-minute increments, knowing of course that things would change, but at least laying out some road map. And overall, it was lovely, relatively easy, and certainly left me wanting more. People said hello in passing, and were largely friendly. Often, when I attempted to speak French, I received responses in English. (I could really use the practice, but yes, it was easier…). The landscapes with beaches, mountains, and vineyards, as well as the lush biodiversity, reminded me of California. Handheld showers that are not completely enclosed. I still don’t understand how French residents have, apparently, mastered the art of not soaking the entire bathroom. Once I returned home, I searched online for ‘French shower.’ After wading through commentary that they don’t take any (just splash cologne instead! ), I learned that electricity is quite expensive in France. Many residents run water heaters only overnight when electricity is cheaper. So they commonly turn the water off in between rinsing, lathering up, shampooing, etc. This makes sense. But for me, a shower is not just a hygiene ritual, but a meditative, rejuvenating space where I rinse away stress and worries along with dirt and germs. Great ideas sometimes come to me in the shower – and apparently, I’m in good company there for a variety of reasons. Yet my indulgent American routine depends upon a steady stream of water, at a constant temperature, from a fixed showerhead, forming soothing steam, within an enclosed, comfortably warm space. I can’t see any relaxation in turning the water off and on, struggling to regain the perfect temperature, while allocating one hand – 50% of the minimum hands necessary to wash long hair – to wrangle a showerhead. So much for a serene shower to send me off into sweet slumber! Only an octopus could efficiently operate this scenario. As a user commented on a Fodors community thread, “Oh, the poor dears–European showers are so weird, and Americans, it seems, so uncoordinated! !” Once I stayed put in my work hotel for a few nights, I did figure out that it helped to point the water toward the corner of the walls and squat down. It took the subsequent online research back stateside to realize that reducing water pressure would likewise reduce splashing; this would not have occurred to me, as strong water pressure brings me too much joy. I never realized how American it was of me to view showers as meditative and pleasurable versus utilitarian and, well, awkward. The Fodors thread further highlights factors like the extra effort, cost and chemicals in cleaning shower curtains, given France’s small washing machines with long cycle times; the expense of glass panels or shower doors; and American building code stipulations for humidity-reducing exhaust fans, which would be tough to implement in older European structures. For all these factors, the French have found it easier to take expedient showers, with some inherent wizardry that keeps them from soaking towels, clothes and toilet paper, or slipping on wet tile. I felt guilty considering, as Rick Steves aptly commented, “Who besides us [Americans] sings in the shower?” (especially considering the increasingly precious commodity that water is becoming). So, while I adamantly prefer the sensory experience of showering on this side of the pond, I will strive to be more mindful in my water usage. I neglected to take any photos of the shower, only the bidet – but that’s another topic (that Americans seem to be increasingly embracing). Time to take this discussion out of the bathroom. What I didn’t know was that gasoil means diesel. This just seemed counterintuitive to me. 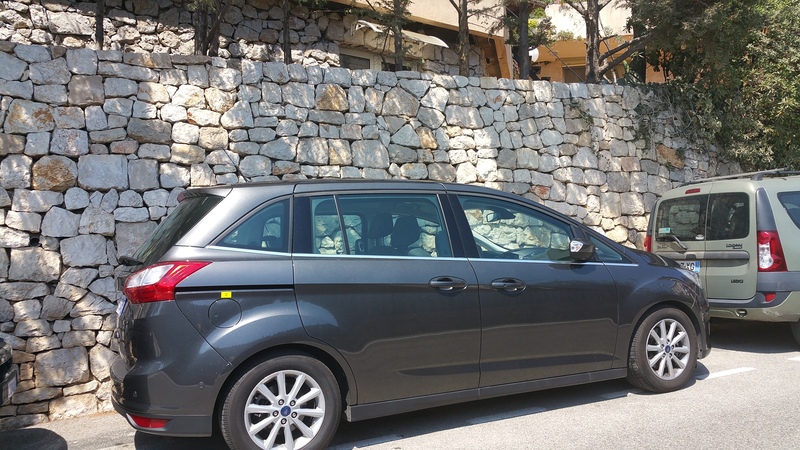 In Marseille, I rented a car myself for only the second time in a foreign country (the first was on the island of Mo’orea in French Polynesia, where most cars simply followed one main road around the island’s perimeter, and off-roading was strongly discouraged. Trying to find a specific beach, my friend and I may have wound up in someone’s backyard after forging through a large sandy puddle, but I digress.) Although that country is also francophone, I don’t recall needing to refill the gas – we may not have used enough in one day on the small island – so I never learned the terminology. I picked what looked to be cheapest gas option that still could apply, attempted to insert the nozzle which didn’t really fit, spilled a bit of gas, kept trying to no avail, took some paces in confusion, looked again at the signs, the prices, and the different nozzles. I repeated these steps, checked the time, and acknowledged that this was taking far longer than it should have, when I had a plane to catch. Finally, I asked a fellow motorist for help. With entreating eyes, my words came out “Puis-je m’aider?” which only after said help was gratefully received and had departed, did I realize I’d asked, “Can I help myself?” Oh well – despite attempting excellent French pronunciation at least in short phrases, even for those I got right, it seemed clear to everyone that I was a foreigner. The obliging fellow gas patron came over and noted, “Diesel!” Okay… That nozzle fit better, after some force which I hesitantly applied. I was grateful for the assurance that I was getting the right fuel, and wouldn’t be charged an outrageous price for not refilling the tank. The rental car was already quite expensive as I needed automatic transmission (this American unfortunately never learned to drive stick, despite knowing it was bound to come in handy). The nozzle didn’t seem to have the automatic lock I was used to, and I was afraid of spilling again as I applied constant pressure, but I guesstimated. After a surprising amount – around 46 euros for three-quarters of a tank, I decided to stop. Luckily, I’d guessed just about right. Just a hair shy of a full tank but hopefully I wouldn’t be charged, or if so it would be minor. Leisurely lunches were a welcome departure from the rushed American lunch hour. Lunch began with an aperitif, then the meal, and was followed by an espresso. My boss had scheduled two hours on our calendars, but slow service in summer season in a small town made the lunches out even longer in some cases. Customer service (and tipping) is not upheld to the same degree as in the US, and servers are better-paid and less reliant on tips. Also, the goat cheese was incredible. I’ve never been so excited about goat cheese. Tolls are expensive. Driving the Autoroute (A8) from Marseille to Menton (about 230 kilometers or 143 miles) and back, with some detours, cost over $50 USD. While American music remains pervasive, the radio offered an impressive range of multilingual music. I enjoyed French hip hop and what sounded like French reggaeton, and a Moroccan station. Walking around the French Riviera, I observed several plant species commonly found throughout southern California and the Los Angeles area. Aloe, bougainvillea (non-native in California, introduced there by the Europeans), oaks, sycamores and olive trees were just a few apparent species. 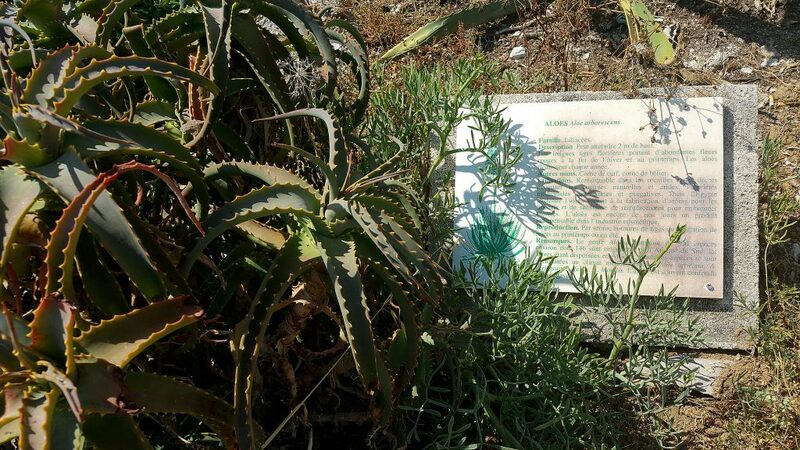 Exploring Plage Mala, slightly west of Monaco, I encountered signs describing vegetation growing on a hillside along the coast, and appreciated the initiative to mark and identify this plant life. 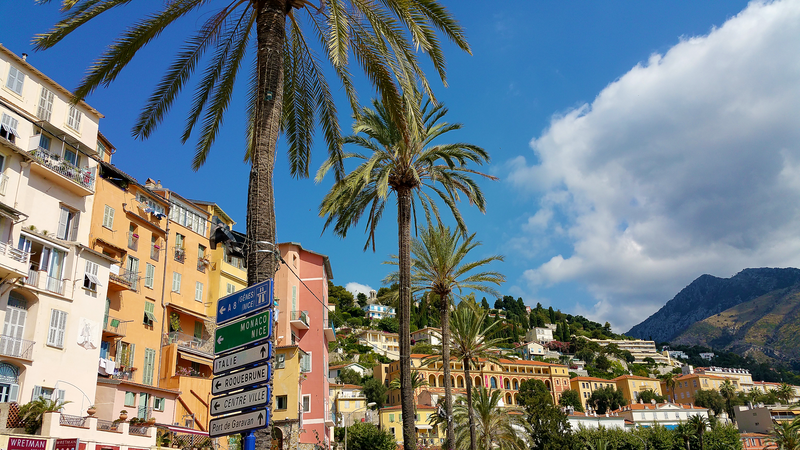 Daylight was waning as I descended from the autoroute that curved through the mountains into the small, scenic town of Menton, close to the Italian border. Verifying the blue dot of my GPS, I confirmed I had located my hotel, as signage for streets and hotels is far more subtle in Europe than in the States. Perhaps also as it was Saturday evening, parking everywhere around town seemed absolutely packed. I finally double-parked at the hotel to check in and locate the available parking indicated on my reservation. A young redhead with a British accent checked me into the room I had booked for my first night in southern France. She then informed me that the parking was full. This was not a possibility I had considered! The fatigue from 20+ hours of travel was beginning to set in. I asked about subsequent possibilities, and learned there was a paid lot about 10 blocks away. Okay… I took my bags upstairs, so that I wouldn’t have to make the long trek laden with my belongings. As I sized up the bathroom (a toilet, handheld shower and drain in the floor in close proximity), and eagerly anticipated the shower part, less the handheld part – the phone rang. The front desk let me know that they had made room in the parking lot. Wonderful! But then, a policeman appeared like a parking lot angel, offering me a different spot that was actually doable. When I returned to reconcile the numbered spots at the front desk, they didn’t charge me for the trouble. So after 20+ hours of plane and car travel, I went from zero parking, to two free parking spots (well, perhaps one and three quarters). A reminder that things have a way of working out! Tiredness tends to inversely affect my patience, but I was glad that I remained calm, and simply took the next step in front of me. The next day, I walked around Menton in the morning, and planned to have lunch across the border in Italy prior to working my way back west. 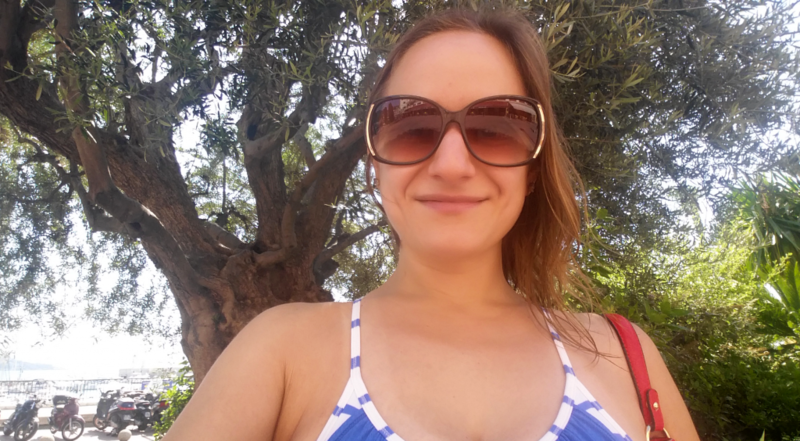 I’m three-quarters Italian, and previously only spent about 12 hours in Rome on a layover between Morocco and the US. 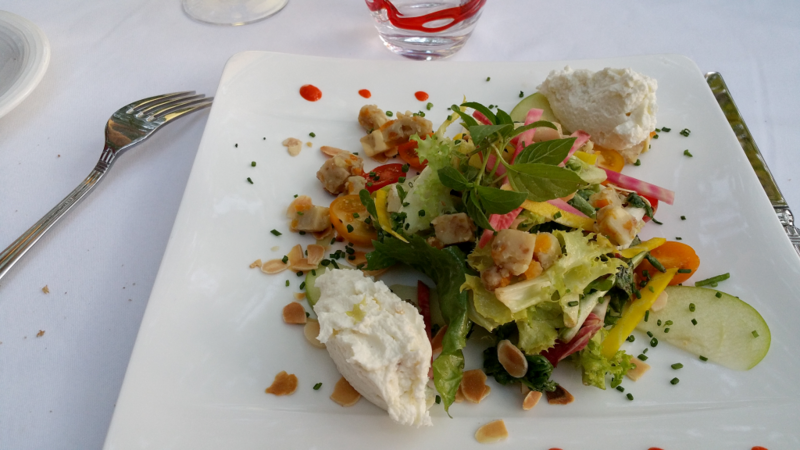 That was another instance of making the most of a short time, as I enjoyed an amazing pasta meal and walked amid beautiful old architecture, statues and landmarks. This dip into Italy’s western edge would be another tease, but still something, until I can plan a proper exploration of the country of my origins. Browsing Google Maps, I’d found Spiaggetta dei Balzi Rossi, with great reviews and a menu featuring items like ‘Ceviche of Sanremo prawns, burrata and tomato water,’ ‘Tagliolini with squid ink, Sanremo prawns, pachino courgettes and candied lemon,’ and ‘Salmon tartare, black rice and smoked yogurt sauce.’ I was sold! I knew where I wanted to dine for lunch on my first full day of the trip. 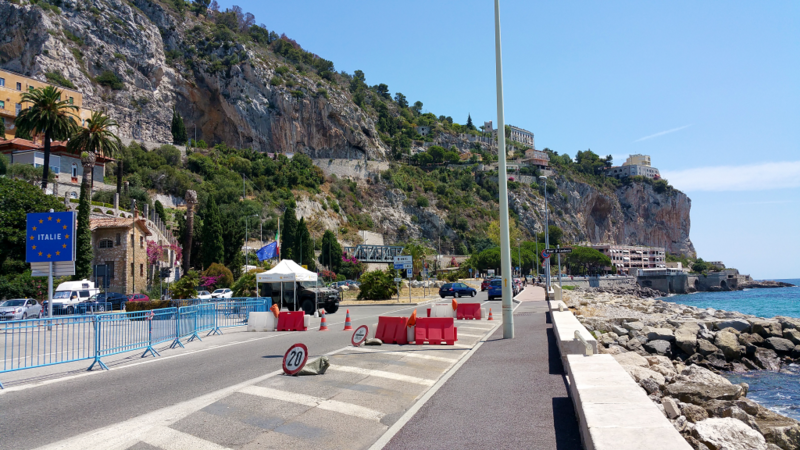 As parking was again an unknown, and everything looked fairly close, I decided to park on the French side of the border and walk across – my first time crossing a border on foot in Europe. (I’ve done so between the US and Mexico at a couple points, and especially with the open borders among EU countries, this was a far different experience.) I walked past scenic cliffs and caves to my left, and glittering ocean in hues of turquoise and azure to my right, working up an appetite. 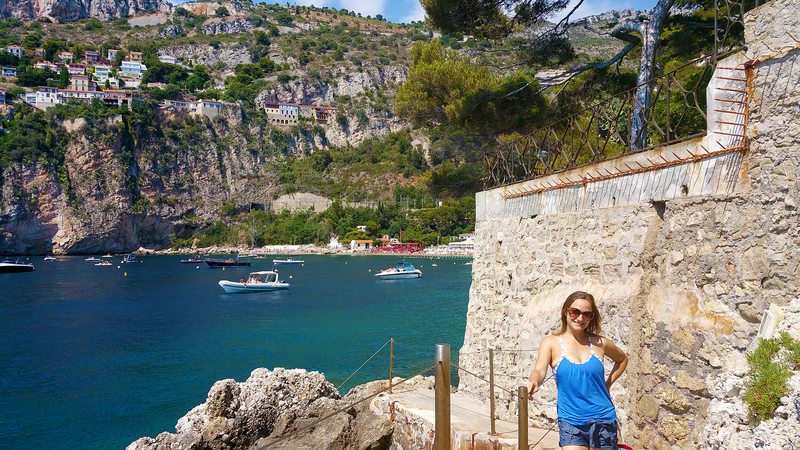 I paused and pivoted slowly to take in all the beauty, with colorful views of Menton and the harbor behind me, and familiar foliage like yucca and bougainvillea rising up to the cliffs above. Finally, I arrived at the undeniably gorgeous restaurant. 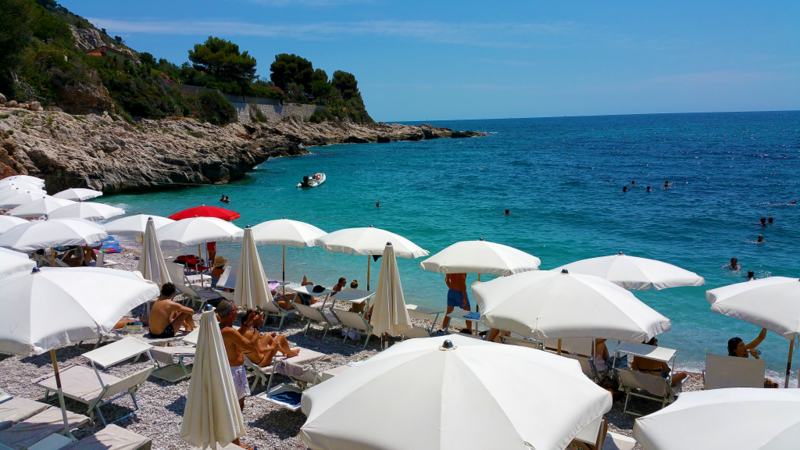 Its patio was situated along a small beach with smooth pebbles, adorned with white tables and umbrellas. And again I was told – it was full. This was high season in Europe! It was barely 1pm at this point, and they were fully booked until 4pm. I asked if there was any possibility to sit at the bar, and I could have gotten a drink, but they wouldn’t serve me food. The epic-sounding food… but I couldn’t wait until 4pm. 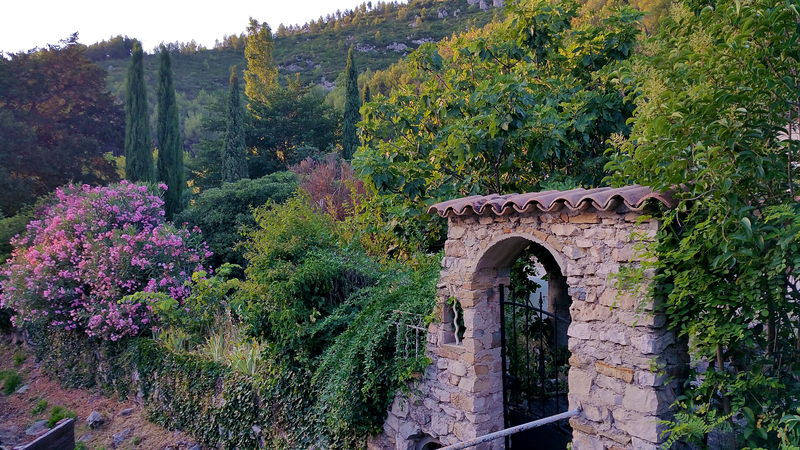 There was much more I wanted to explore throughout the French Riviera, and I had a hotel reservation for that night in Nice, where I hoped to arrive with some daylight left. 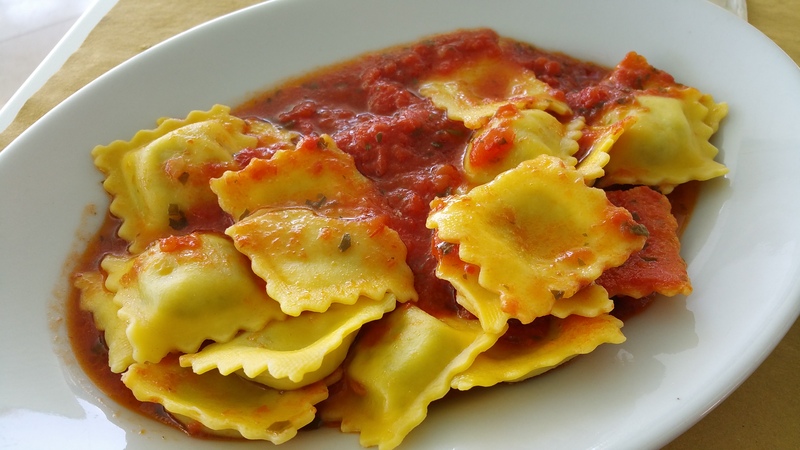 However, the desire for lunch in Italy stuck with me, so I decided to return to my car and drive back across the border, to see what I might find. 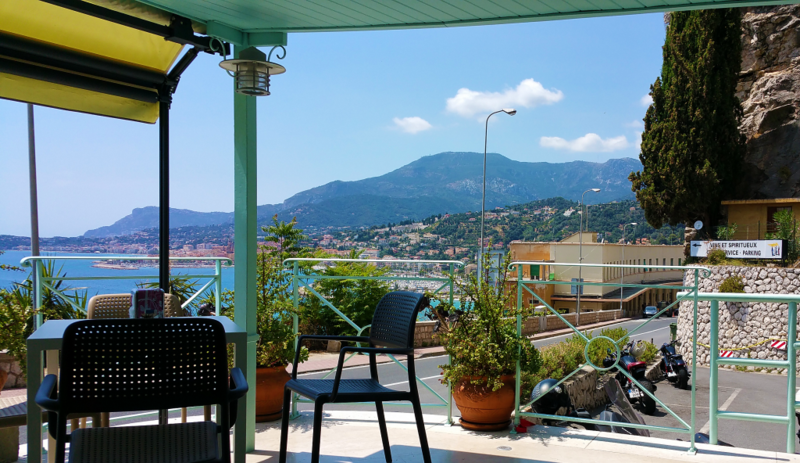 The prospect of a latte in Latte, Italy (a village within the municipality of Ventimiglia) sounded too tempting, and what better precursor to an evening where I hoped to have a salade niçoise in Nice? 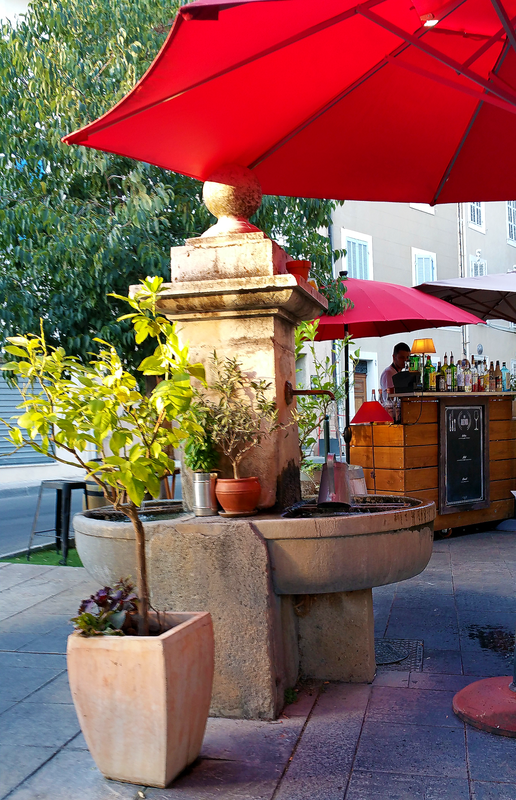 I roamed the narrow streets by car as slowly as I could without irritating other drivers, but saw surprisingly few places where I could sit down for a bite. I saw only a couple somewhat ramshackle takeout places, and one café with no one but old men sitting outside smoking. 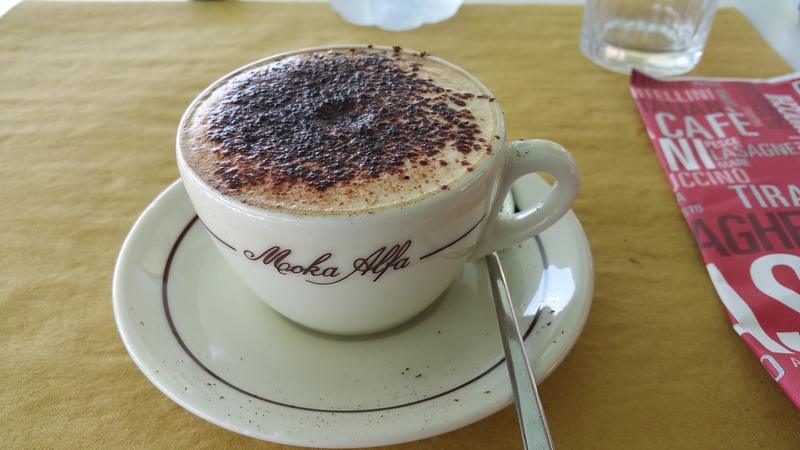 As hunger mounted, I decided to give myself 20 minutes to find a spot, which turned into 25 or 30 – but then I did find a casual café, Moka Alfa, in the city of Sanremo, with a lovely ocean view. And there was parking! I felt awkward actually being Italian but not knowing much more than Buongiorno and Grazie, but many people still spoke both English and French. As I ate my meal, a man and his mother dining near me finished their leisurely meal with limoncello. I savored a plate of perfectly cooked ravioli, and a cappuchino – no latte in Latte, but a cappuchino in Sanremo did the trick! 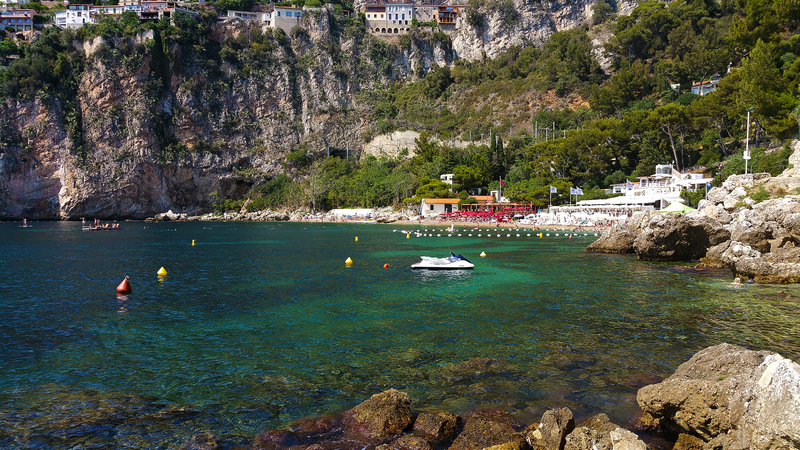 In making my way back west along the French Riviera from Menton, I planned to stop at Plage Mala, which looked stunning from online research. Again, it was incredibly difficult to find parking, and I ventured increasingly further from the entrance of the beach. Finally, I did find a spot, and decided to go ahead and explore the coast there. I parallel parked on the left side of the road, downhill, very closely against a wall, with the car’s sensors furiously beeping at me when I got within what I knew was still a safe distance of the wall. Behind me, cars waited, with no room on the narrow road to go around me. I handled it – and wound up discovering an absolutely gorgeous walk around the coast, perhaps a back route to Mala Beach, that I likely would not have discovered had I found easier parking close to the beach entrance. This parking job may not look like an extraordinary feat, as I have some inches to spare from the car’s bumper behind me. But on an incline (perhaps not steep but incline nonetheless), on the left, against the wall, with the car madly beeping, and traffic behind me – I was pleased with my performance. The lack of sand didn’t stop anyone from enjoying the sun and surf. My walk began along a section of coast where people were stretched out on the rocks, and the waves appeared a bit rough for swimming. I proceeded along the path, up and down some extremely narrow stairs that hugged the edge of the cliff. Mala Beach itself was part public, part private – with clubs that didn’t appeal at the time – and overall very crowded and rather small. Rather than fighting for a tiny patch of beach, I found a random block of concrete along a trail, and relaxed for awhile, soaking in the sun and exquisite views. So again, I was happy that despite the parking difficulties, the spot I found lent itself to even better discoveries! Two private clubs, with red and white chairs and umbrellas, dominated Mala Beach, while the public section was crowded with towels. 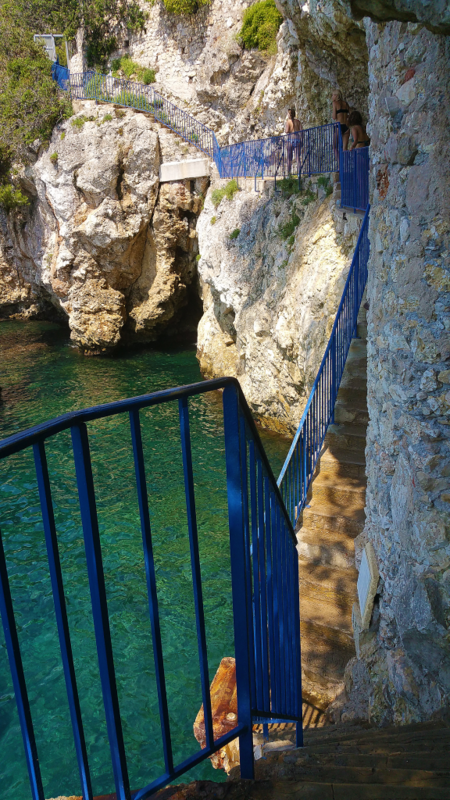 The narrow staircase hugging the coast on the way to Plage Mala – which saw its share of young cliff-jumpers. 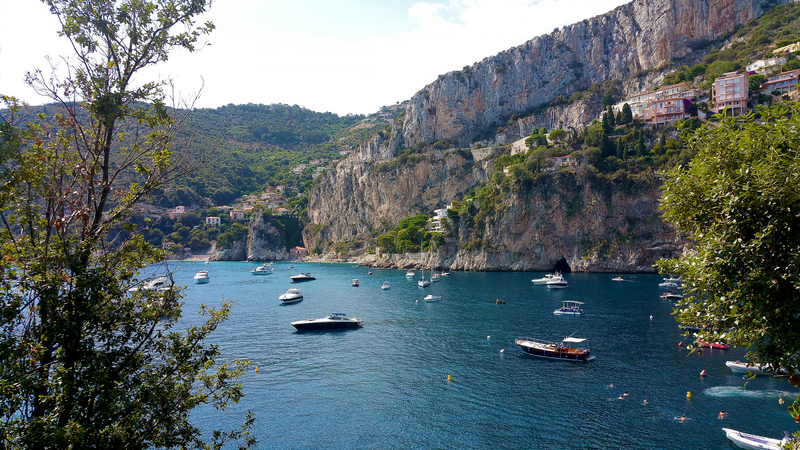 Steep limestone cliffs line the coast, with motorboats dotting the azure Mediterranean waters below. The day before I was due in the office, I hoped to venture to Sault to see the lavender fields, as they were in bloom that time of year. But jet lag – unfortunately not aided by a carafe of rosé with dinner the previous night – had me feeling exhausted on my last ‘free’ day. I arrived to my work hotel in Gémenos a bit earlier than anticipated, walked to a nearby restaurant for an early dinner, and then proceeded to simply walk around the town and orient myself. Observing textured walls, well-tended plants, and general lushness, I marveled at the aesthetic pleasure of every detail within sight. Along some hilly streets, I saw abundant foliage, expansive views, and an orange-streaked sunset. 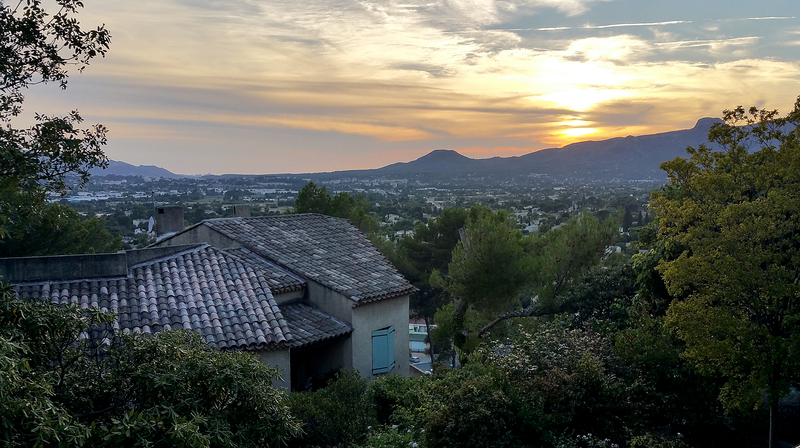 And I relaxed, with this quiet time to myself, absorbing the vastly different pace of this Provençal town of 6,200 residents, compared to my hometown of Los Angeles. At this fountain, I saw two bikers stop to refill their bottles with potable water, apparently sourced from the St. Pons river nearby. The trip challenged me to balance my urge to discover, and ‘fear of missing out,’ with the very real limits of my time and energy. It compelled me to stay open and flexible, calm and aware. I felt grateful for my yoga practice, from which I draw inspiration for mindfulness when I encounter taxing situations – as though each practice builds cumulative reserves that I can draw from when needed. And this mindfulness, in turn, helps me to make the very most of my moments present in a beautiful new place, no matter how brief. I tremendously enjoyed your charming and vivid account of your “Francais aventure” ~ your perspectives and experiences are humorous, reflective and so much fun! You have a gift in taking the reader with you ~ like riding on your wings while soaring and savoring each experience with much life, depth and color. Your comments about European showers are hilarious ~ and spot on ~ I agree they are definitely not conducive to singing nor relaxing nor even coming up with great ideas. Far too much of an ordeal rather than a pleasure. As you so aptly described it, only an octopus could master a hand-held shower! You also provide much inspiration of how to travel with the least amount of discomfort ~ by being mindful and aware, remaining calm and poised. Looking forward to more!